Jessica Coblentz (USA) is an Assistant Professor of Theology and Religious Studies at Saint Mary’s College of California. She also holds a 2017-2019 Postdoctoral Fellowship from the Louisville Institute. 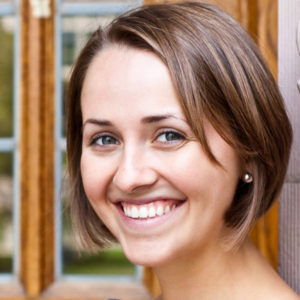 She earned her PhD in systematic theology from Boston College in 2017. I treasure those spring afternoons I spent lying in the grass of my parents’ front yard. When the sun had finally broken through the stubborn clouds of the Seattle sky, I postponed my math homework to lounge with a book. I was a peculiar sixteen-year-old: I read Saint Augustine, whose Confessions I had happened upon while browsing the local bookstore. I had thought I recognized the author, which in retrospect is quite unlikely. My inexplicable impression of familiarity was fortuitous, however, because I recognized myself in the story of the North African bishop as I began to read. The young man’s singular drive toward a higher purpose—a Higher Being—captivated me. I shared his insatiable desire for something more in my life, and his testimony prompted me to wonder whether I, too, could make my life about God. I had no idea this would lead me into professional ministry and Catholic theology, but, like Augustine, it did. This is a glimpse of some defining scenes from the first ten years of this vocation.